Winter Graduation 2010 was a Huge Success! | The Pinnacle P.O.V. Pinnacle Online High School’s Winter 2010 Graduation ceremony was held on December 15, 2010, at the Mesa Convention Center. The site and virtual students enjoyed a combined ceremony, where more than 70 students walked across the Graduation stage and earned their high school diplomas. The crowd of family, friends and Pinnacle staff packed the house to help cheer on the Graduates. Founder and CEO, Dr. Michael Matwick was the evening’s keynote speaker. Two student speakers also delivered touching messages to their peers. Five Pinnacle Scholarships were awarded, as well as outstanding student awards from the sites. It was a truly special evening where academic achievement was celebrated. 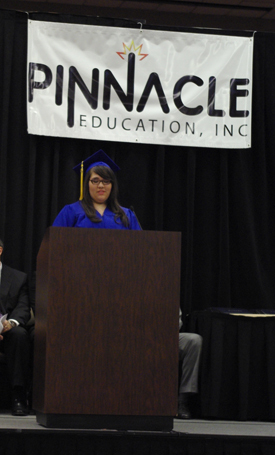 Pinnacle will hold its 30th Graduation ceremony in May of 2011. We hope to see YOU there! To see more photos from the ceremony, check out our Facebook photo album. ~ by pinnaclepov2224 on January 5, 2011.